In my future posts, you’ll probably hear a lot about players’ ages at the time they achieve various milestones. I will present those dates as numbers with (usually two) decimal points, rather than the common Years-Months-Days format. 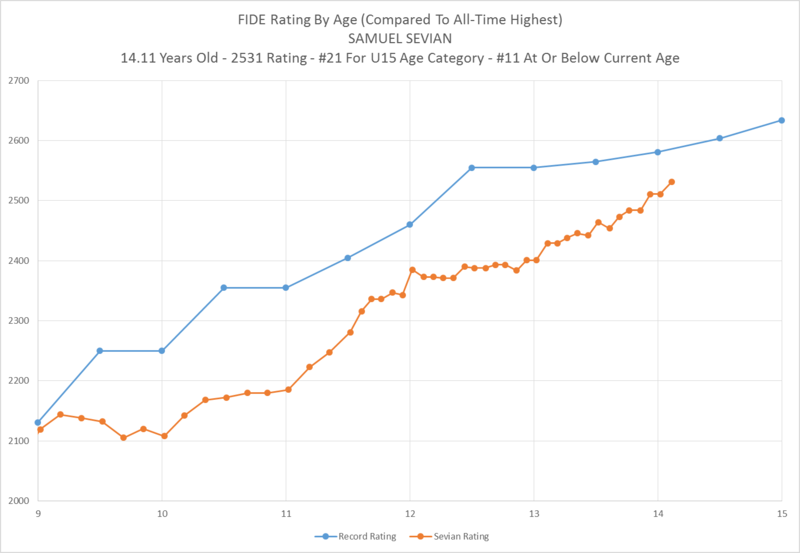 The latter is more easily understandable: we know exactly what it means when we say that, for instance, Wei Yi is the youngest player to achieve a rating of 2700+, at the age of 15 years, 8 months, and 29 days*. Saying that he achieved that milestone at the age of 15.75 years old actually makes this a poor example, because that’s pretty clear, but if the number were 15.63 instead it would be harder for our brains to immediately process it. We’re not used to thinking of ages in terms of fractions of years (except the “big” fractions like 1/2, 1/4, 3/4). We break years down into months, not increments of 0.01 year, and we break those months down into days. Note that there is an apparent tie for 8th place between Caruana and Giri. Were they actually the exact same age? Well, let’s look at Year-Month-Day format first. Caruana was born 7/30/1992, and achieved this milestone on the 4/1/2008 rating list. From July 30 1992 to March 30 2008 is 15 years and 8 months. March 30 to April 1 is two days, so he was 15 years, 8 months, and 2 days old. How about Giri? Born 6/28/1994, he broke the 2600 barrier on 3/1/2010. From 6/28/1994 to 2/28/2010 is 15 years, 8 months, and we add 1 day from 2/28 to 3/1. So it would appear that Giri achieved this milestone 1 day earlier than Caruana did! The chart above placed them in the wrong order, right? Well, no. Let’s break Caruana’s age down further. The “15 years” component from 7/30/1992 to 7/30/2007 is 15 * 365 = 5475 days, right? Nope. Leap Year exists! That particular span includes three extra days: 2/29/1996, 2/29/2000 and 2/29/2004. So “15 years” in this case means 5478 days. What about the “8 months” portion? Well the months whose last day was included in that span are June through February, meaning we get 5*31 + 2*30 + 1*29 = 244 days out of the span (remember that 2008 was also a Leap Year). Finally we add in the “2 days” portion, for which no breakdown is needed, and we see that Caruana achieved his first 2600+ rating when he was 5478 + 244 + 2 = 5724 days old. Giri’s “15 years” include four Leap Years, not three, and his “8 months” do not include a February, which adds two days to his total. So “15 years, 8 months, and 1 day” is, in his particular case, 5725 days. Despite appearing to have been one day younger, using the more common format, it turns out that Giri was actually one day OLDER than Caruana. My chart above is correct after all. Now of course it doesn’t matter at all which of two amazing players, currently ranked #3 and #4 in the World, got to 2600 one day faster than the other. However this example serves perfectly to demonstrate why I will not use the Years-Months-Days format to express players’ ages. In fact, behind the scenes, all my ages are simply number of days, but I don’t imagine anyone wants to know that Wei Yi was 5751 days old when he broke the 2700 barrier, so I divide ages by 365.25 (to account for Leap Year) and present them as just “years old”, rounded to the appropriate number of decimal places for the particular purpose in play. I hope you appreciate my precision. *This isn’t technically true yet, but it appears that it will become true on March 1st, when the next FIDE rating list is published.